October 8, 2015 : Is Your Roof Ready For Fall? School is in full swing and summer is now over. The good news is that fall is here! While the autumn is one of the most beautiful times of the year, it’s also a sign for what is to come. There are a few things you should do to your roof before the serious winter weather sets in! Are there lost shingles or debris in my yard? Is there puddles of water near my foundation? Are there water marks or wet spots in the attic? If your roof has developed a leak, even the tiniest leak can build up quickly and cause huge problems for you. Especially when the ice and snow begin to build up. This will cause expansion and contraction in your roof material. Believe us, those tiny leaks can quickly escalate into a huge problem! If you haven’t taken a look at your roof in a while, now is the time for an inspection. If you know what to look for, you can get up on a ladder and inspect your roof for issues including missing or damaged shingles, warped flashing, and other issues that can cause larger problems. If you are not comfortable climbing up to your roof, call an experienced roofer to tell you the overall condition and what should be addressed before winter weather hits. One of the most important tasks to complete is to clean out your gutters and downspouts. 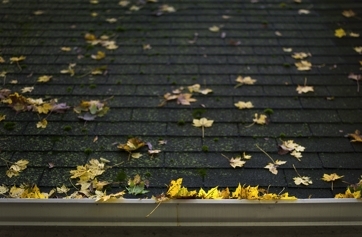 During autumn, leaves and other debris will quickly fill up both your gutters and downspouts. This will cause build up and eventually problems like mold. If your gutters begin sagging, the leaks can quickly cause even more problems, allowing puddling water to accumulate both on your roof and near the foundation. What are you waiting for? Get started on your fall roof inspection today! You can also securely shop our full line of residential roof tools and equipment now!